Is Your Mattress Secretly Out To Kill You? Have you considered that one of the most consistent places you ever will be, for at least 8 hours every day of your life, is in your bed? You probably don’t realize this but next to your family, your bed is possibly one of the most important things in your life! Many studies now show as a society we get at least 1-2 hours less sleep than in the 1940’s. The CDC in 2009 reported nearly 9 million people take sleeping pills for insomnia, disrupted sleep, or painful sleep. Sleep problems are becoming epidemic along with the rise in illness and autoimmune disease, diabetes and toxicity. Throughout the years, mattresses have seen a huge metamorphosis from just a regular box spring made of woods, coils and cottons to synthetic plastics, latex, elastic and foams. The evolution of new mattresses with new material means additional chemicals to be aware of. We as consumers are taught to look for mattresses that can enhance deep sleep, give our spines proper support and relieve painful pressure for 8 hours. We generally assume most mattresses are environmentally safe, but a major concern with the new and improved mattresses are fumes and chemicals that come from the synthetic material in our modern plastic world. The top part of the mattress is meant to be supportive and comfortable. This support layer for your spine and bones can be comprised of a core made of air, foam or innerspring unit. The comfort layer is meant to create air circulation and remove pressure from your body and is made of a combination of synthetic latex (rubber), memory viscoelastic, soy, and polyurethane foams. These synthetic materials have replaced the old steel springs and cotton used in the “old days”. In addition to these synthetic compounds, in 2006 the federal government passed a law that required mattresses to contain enough Fire Retardant to withstand a 2 foot wide blowtorch open flame for 70 seconds. The use of petroleum based products are what causes off-gassing. Carcinogenic and harmful, Volatile Organic Compound (V.O.C.) are of concern like formaldehyde (a preservative), chlorofluorocarbons (blowing agents), and Polybrominated Diphenyl Ethers/PBDEs (fire retardants). These chemicals may present a problem in people with sensitive respiratory systems or chemical sensitivities. It is quite common to see eye, nose and throat irritation, nausea, and headaches that may develop with exposure. Studies have been linked to longer-term effects like central nervous system damage, organ damage, and cancer. The fastest growing segment of the mattress industry is memory foam made from polyurethane foam and additive chemicals. Polyurethane foam is highly flammable and therefore many flame retardants are usually added to the mix. The synthetic support from the new foam materials in latex and memory foam wears with use quicker than with cotton or natural rubber. As chiropractor I know the importance in having firm support for the neck and shoulders and the low back and hips. This requires proper pressure to hold up these body parts against gravity. The new synthetic mattress material softens with repeated use and you begin to see body indentations, impressions and dips due to the materials inability to rebound over time. The life of a new mattress is only 3-8 years compared to its old cotton counterpart of 20 years. Fire retardants are chemicals of all sorts including, methylene chloride, heavy metals, phthalates and formaldehyde. Without having to pull out an encyclopedia of sources proving the dangers in sleeping and breathing in chemicals, I think it’s safe to say, “THIS JUST CAN’T BE GOOD!” Personally, I wouldn’t want my baby, loved one or myself breathing chemical soup all night, every night. Talk about nightmares! Mattress producers are required by law to prove to the federal government that their products can extinguish an open flame but not required to tell the consumer what materials they are using. In Vienna, VA there is Savvy Rest Natural Beds (www.savvyrest.com); they offer a 10% discount in store to anyone who mentions Dr. Seleme. At Urban Mattress (www.urbanmattress.com), they have various discounts on their items and even sometimes a free pillow—just ask! Tell both of them Dr. Seleme sent you to receive the discount offer. You can go to their websites to look at mattresses or go to their store in Vienna to try it out. Another great source is www.cozypure.com, although they don’t have a store in the area, you can always take a drive to their warehouse in Norfolk, VA and try out one of their natural rubber mattresses. I believe staying informed and aware of your environmental surroundings is one of the best ways to protect you and your family from unseen chemicals and toxins in our everyday lives. If you are looking for a better way to get a safe and peaceful sleep you make want to look into these organic, natural mattresses for your bed. Here’s to getting all the comfy zzzzzz’s you deserve. See you in the morning! How to Avoid the Tens of Thousands of Chemicals in Your Food! More than 10,000 chemicals in the form of emulsifiers, solvents, and preservatives are used in food processing and storage? Below are a few of the many produce and foods with high pesticide or chemical content. Celery is one of the most pesticide-laden vegetables with a high content of the pesticides chlorantraniliprole and spinosad, which are very high in its toxic effect. Unfortunately for you potato lovers there is a very high pesticide content such as that of chlorpropham and o-phenylphenol that can actually increase the toxic impact of potatoes as well as, disrupting the endocrine balance of your body. Research shows that a typical lettuce produce has been treated with 9 different pesticides before actually reaching your supermarket store. Research reveals often lettuce is coated with some pesticides such as DDT and Lindane. When was the last time you saw Benzimadazol, Dieldrin, Maleic Hydrazide Thiabendazole, Methylparaben, Dimethyl polysiloxane growing in a farm field or your back yard? To help you avoid these dangerous chemicals, print and keep this handy list of high and low pesticide produce in your purse or wallet when you go grocery shopping! 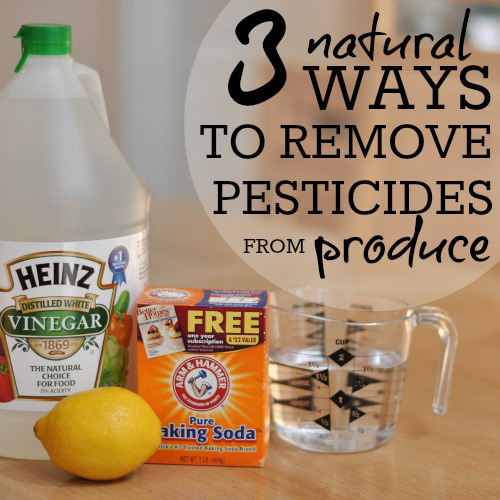 Wash Away Pesticides, Waxes, and Chemicals – Naturally! We know that it’s not always feasible to buy organic all the time, so here are 3 natural methods for properly wash produce to remove pesticides and waxes. – Soak produce in 1 part white distilled vinegar and 4 parts warm water for 30 to 60 minutes. – Spray a mixture of 1 TB lemon juice, 2 TB baking soda, and 1 cup water onto produce and let sit for 5-10 minutes. Rinse off and enjoy! Commercial fruit and vegetable washes can also be used, just make sure that the ingredients are all natural and free of harsh chemicals. Besides buying organic produce and carefully washing them, here are other ways you can avoid harmful chemicals from food in your life. The lining of microwave popcorn bags contain PFOAs. The high heat created in the Microwave can convert this harmful chemical into vapors that spread throughout the popcorn. They steam given off as the bag is being opened immediately after heating can cause harmful fumes to the body as well. PFOA toxicity has been linked to thyroid disease in humans. Air pop non-GMO popcorn yourself. If you don’t have an air popper you can use kernels in a paper bag in the microwave. Simply add about 1/2 cup of popcorn to a brown paper bag, twist the top then microwave listening carefully for when it’s finished popping or snack on some healthy chopped vegetables or fruits. A chemical are used to help keep fats from going rancid. They’ve been linked with serious concerns like increasing asthma, hives, cancer risk, and disrupting estrogen balance. Read your packages carefully – it’s often hidden in cereal, nut mixes, gum, butter, meat, dehydrated potatoes. 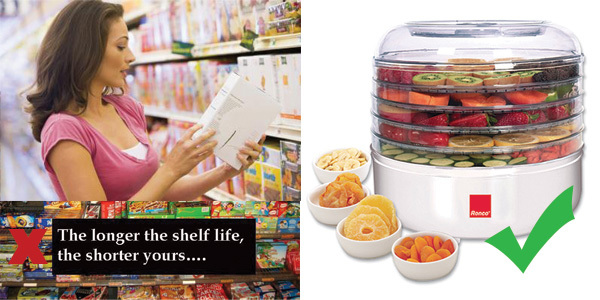 Use a dehydrator to make your own veggies and fruits! So easy and inexpensive and chemical free! Only chew gum from health food stores WITHOUT aspartame and other additives. Mix your own nuts – get a variety of raw nuts and roast them with spices or raw. Remember nuts are a healthy fat but still a fat and will add weight especially to the waist line. No more than 6-8 per serving. Bisphenol-A, aka “BPA.”This is one found in canned foods, such as tomatoes, beans, fruits and vegetables. It is an estrogen-like chemical that is pervasive in canned foods. BPA has been linked to diabetes, ADHD, reproductive cancers, and thyroid disorders like hypothyroidism and obesity. The acidity in canned tomatoes can pull even more of this chemical into the food. Never heat or freeze plastic containers, including leaving them in your car during a hot day or at night. Make big batches of fresh tomato sauce and freeze in glass containers. Make beans from dried beans and store for later use. Choose frozen fruits and veggies (not canned) when fresh is not available or in season. Look for tomato and other packaged products in glass jars. Across the United States, the EPA took samples of people’s fat cells (adipose) and analyzed the samples for the presence of various toxins. In 98% of the samples they found many toxins, including benzene, PCBs, DDE (a metabolite of DDT pesticide), dioxins, toluene, and chlorobenzene, all of which are highly damaging to the immune system and compromise every tissue in the body. Once these chemicals and metals create a “home” for themselves in you fat and nerve cells, it can take years, if ever to have them removed on their own. These are only a very few examples of the barrage of chemicals or bodies struggle to remove every day from typical foods that are eaten. Our bodies are like any other machine you know of…if you don’t clean it, eventually it will break down in the form of autoimmune disease, cancers, arthritis you name! When the amount of toxins exceed the body’s ability to excrete them, our body will begin to store these toxins. The accumulation of toxins can seriously impede our physiological health and lead to chronic disease. If you identified having some of these health symptoms, consider detoxifying your body with help from us at Seleme Health Center. We use 2, 4, or 6 week specific protocols to remove these harmful heavy metals and chemicals from your body using Frequency-modulated Low-Level Laser protocols, Far Infrared Saunas, nutritional supplements and homeopathic remedies, just to name a few ways to help eliminate the toxic influences that block your body’s ability to completely heal. Call us today at (703) 273-0573 for more information or to customize your detoxification protocol!